ALAMEDA, Calif. /California Newswire/ — A blind man. A woman who stutters. A wheelchair user. A Little Person. 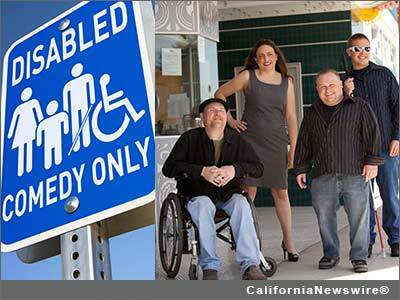 While this may sound like a description of a support group, it is, in fact, the lineup for the "Comedians with Disabilities Act," a comedy tour that the San Francisco Examiner called "The most unconventional comics to pop up in 2011." Made up entirely of performers with different disabilities, the troupe is bringing their "special" brand of humor to the Pacific Pinball Museum on Saturday, September 14, for a one-night only performance benefiting the museum. The foursome, all of them working northern California comedians, met each other through the comedy club circuit and decided to band together to treat audiences to a unique and unforgettable experience. "Lots of able-bodied comedians out there tell blind or wheelchair jokes and get the audience to laugh AT people with disabilities," said Michael O'Connell, the group's wheelchair representative. "But we thought wouldn't it be more fun for the crowd to laugh WITH people with disabilities instead? That's guilt-free fun right there." Since their first sold-out show in Sacramento, the group has been in growing demand, getting booked at such lauded venues as the Laugh Factory in Hollywood and San Francisco's Punch Line. Their comedy comes from the lifetime of experiences each has had due to their individual challenges. They see the tour as not only a chance to entertain, but to educate people on disability issues. "We're all comedians first," said Napa native Steve Danner who identifies as a Little Person, "and it's a comedy show. But who says you can't make people laugh and send them home with something to think about too?" Danner's comedy career began as an audience member at a club. The comedian on stage that night decided to have some fun at his expense, and Danner's skills in heckling back at him led the comic to approach Danner after the show and suggest he give comedy a try. He did so, and soon began a career as a prolific comedian and producer, delighting crowds at clubs and comedy rooms all over the west coast with hysterical tales centered heavily on his dwarfism. His comic journey keeps him on the road much of the time, but as Danner is fond of saying, "Shrimpin' ain't easy!" Michael O'Connell was diagnosed with Muscular Dystrophy at two years old and began using a wheelchair in 1995. But it wasn't until years later that a friend dared him to try doing comedy at an open mic night at a Sacramento club, and after ending up winning the competition that first night on stage, he never looked back. He's played comedy clubs from Seattle to L.A. (including the Hollywood Improv and the Jon Lovitz Comedy Club), been featured in newspapers and on radio and television, and counts several Hollywood celebrities among his fans. His business card reads "100% Comedy, 0% Stand-Up." Sacramento's Eric Mee was only eighteen years old when, while protecting a young child, he was stabbed in the chest. Complications resulting from his injury led to the loss of his eyesight. Choosing not to let this drastic life change get him down, he began joking about his condition and giving speeches to groups that were always filled with humor. After many suggestions, he turned his talents to stand-up comedy, and now brings his manic energy and outrageous tales to the stage, both at clubs and college campuses. Nina turned her talents to the stand-up stage to help raise disability awareness through comedy, and performs her award-winning work at some of the industry's hottest clubs (the Hollywood Improv and the San Francisco Punchline) and has shared the stage with some of its biggest names (Dave Chappelle). The Comedians with Disabilities Act will be joined by special guests Queenie TT and Steve Lee who will bring their unique and funny perspectives to the stage. Darren Brown has been DJing for twenty plus years at house parties and various venues in San Francisco. Diagnosed with prostate disease, he has given up on all the "wacko industrial complexes" and seeks stress free enjoyment and sharing joy via music. Proceeds from the show will go to Pacific Pinball Museum, a 501(c)3 nonprofit. Learn more about the museum and its mission and cultural events at: http://Pacificpinball.org/ . The show begins at 8 p.m. Show will contain adult content. Tickets are $15 and are available at the Pacific Pinball Museum and eventbrite: https://www.pacificpinballmuseum.eventbrite.com .